For the majority of children and adults alike in this part of the world, Christmas celebrations are synonymous with Santa Claus: a jolly old man with a red suit and hat, who travels with reindeer delivering presents to children who have been good all year. Many have heard Santa Claus be referred to by other names: Father Christmas, Kris Kringle, and St. Nick. But who is this mysterious figure? How did we get from Saint Nicholas, a fourth-century monk from modern-day Turkey, to Santa Claus, a magical man traveling the world on a sleigh led by flying reindeer? Here is a brief history! 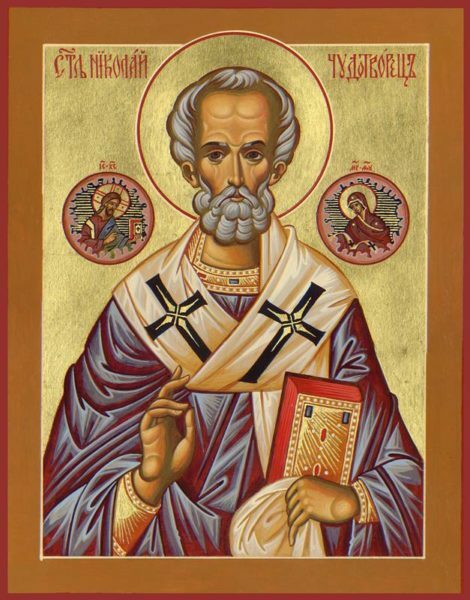 Saint Nicholas was born around 280 AD in Patara, near Myra, in modern-day Turkey. A Christian bishop and monk, Saint Nicholas was known during his lifetime for his kindness and generosity to those in need. After being left great fortunes upon the death of his parents, Saint Nicholas traveled the region giving money to the poor and sick. 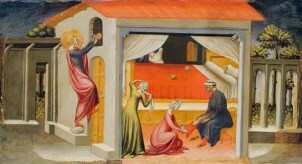 There are a number of legends about Saint Nicholas based on his reputation of giving. One tells the story of three sisters who were at risk of being sold into slavery by their father, as he was too poor to pay for their dowries. Saint Nicholas sympathized for these young girls, and one night, he dropped a bag of gold down the family’s chimney. As stockings had been left to dry by the fire, the gold landed inside a stocking. The next night, he did the same thing once again. The father was so overjoyed to find the gold each time, knowing that this would mean his daughters could go off and marry, that he hid by the fireplace on the third night to find out who was the anonymous donor. Saint Nicholas was caught, but he pleaded that the man not reveal his identity, so as to avoid drawing attention to himself for his deed. The news got out eventually, and from then on anonymous gifts were believed to have been given by Saint Nicholas. 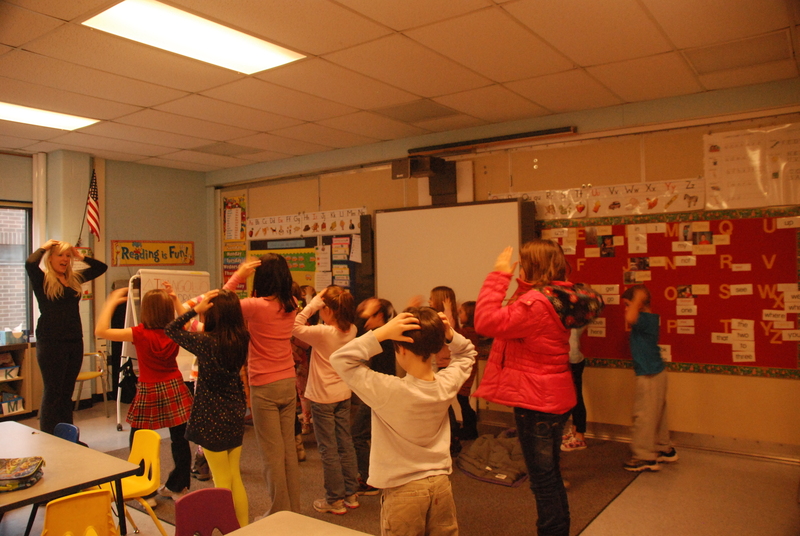 Another story explains why Saint Nicholas is the patron saint of sailors. A group of sailors were caught in a storm off the coast of what is now Turkey, terrified of their ship sinking. 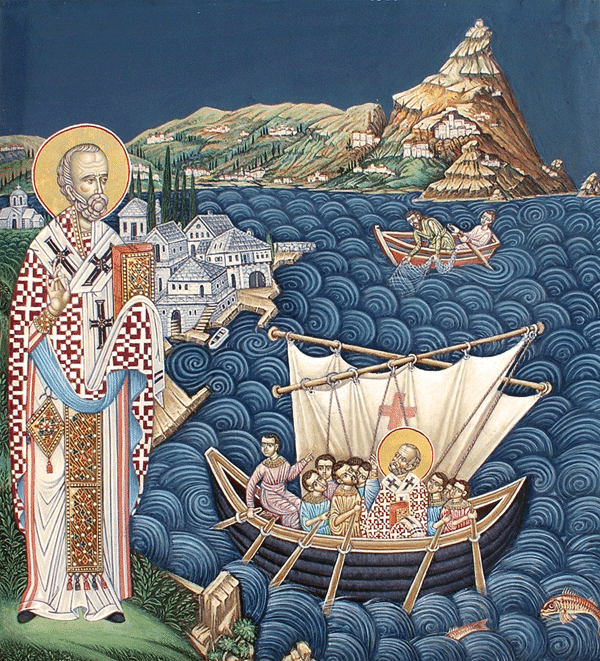 The men prayed to Saint Nicholas, and he immediately appeared before them and ordered the sea to calm down, allowing the sailors to return to their port safely. Now, as the bones of Saint Nicholas are kept in an Italian church named after him in Bari, sailors to this day will carry his statue from the cathedral to the sea on December 6th. They do this to allow Saint Nicholas to bless the waters for safe voyages throughout the year. Saint Nicholas has continued to be celebrated for many centuries, in countries around the globe. In Western countries, his feast day is December 6th, while Eastern countries celebrate him on December 19th. Holiday traditions vary by culture, but all agree that Saint Nicholas comes bearing gifts. In Holland, as well as other European countries, children leave clogs or shoes out on the eve of his feast day, with the hopes that Saint Nicholas will fill their shoes with gifts or coins. Children also leave out hay and carrots for his horse, hoping to receive treats in exchange. It is in fact thanks to the Dutch culture that we have our Santa Claus today! The United States started to celebrate Saint Nicholas after a New York newspaper published an article about the Dutch tradition of honoring Saint Nicholas, as Dutch influence was widespread in the area, in December 1773. 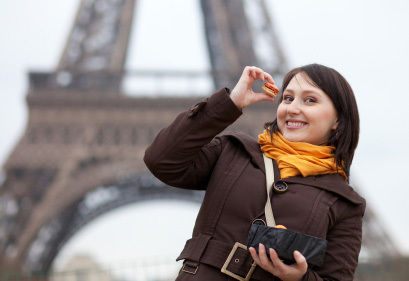 In Dutch, Saint Nicholas is Sint Nikolaas, and the saint has long been affectionately referred to as Sinterklaas. When this name was brought into the English language, it became Santa Claus. This newspaper publication was the first mention of Santa Claus in this country, and it set forth a new wave of Christmas celebration. 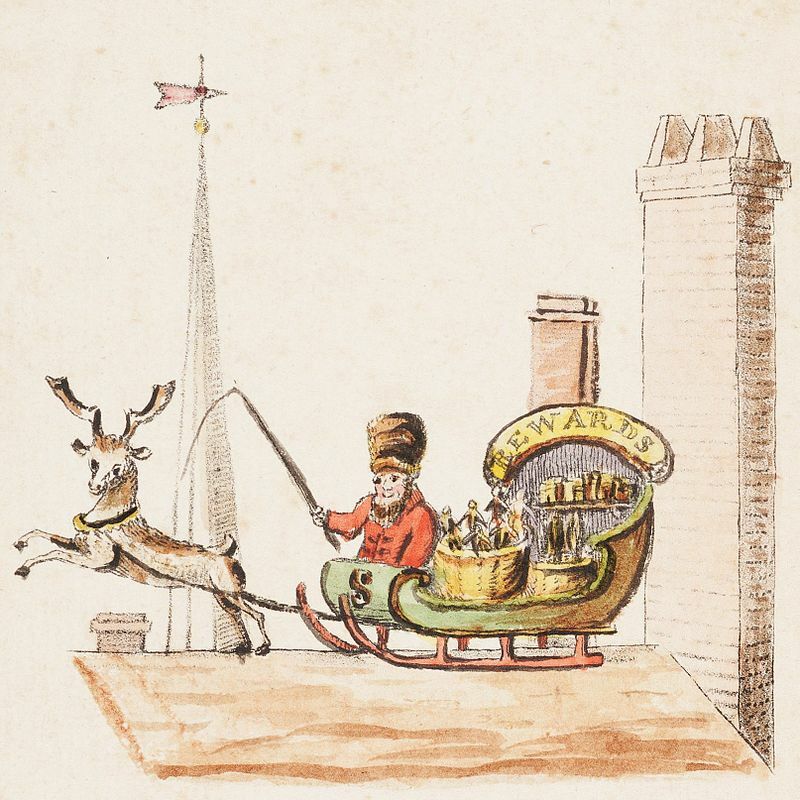 American representations of Saint Nicholas or Santa Claus appeared sporadically for the next several decades, with images varying from a “rascal” with a pointy blue hat to a man with a broad-brimmed hat and a “huge pair of Flemish trunk hose.” In the 1820s, these various ideas were largely swept away by the introduction of our modern-day Santa: an old white-bearded man with a round belly, a jolly face, a red suit, and a sack of toys. 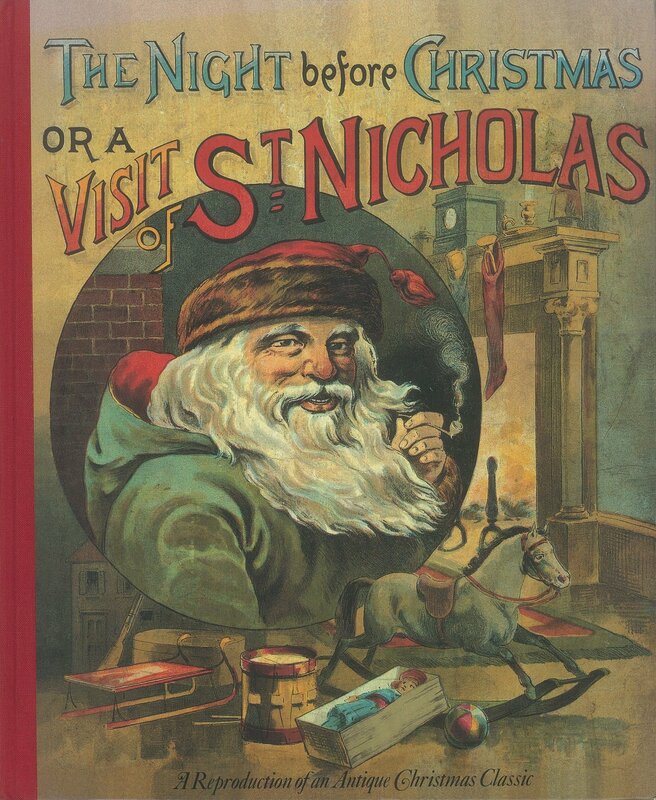 This is thanks to two major book publications: first, a compilation of poems called A New Year’s Present to the Little Ones from Five to Twelve (with reference to “Old Santeclaus”) and, second, a children’s poem by Clement Clarke Moore called “‘Twas the Night Before Christmas, or a Visit of Saint Nicholas.” These works coincided with a newfound interest in Christmas shopping which emerged in the first half of the nineteenth century. 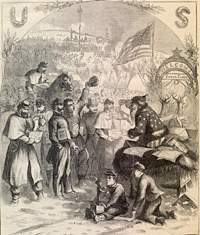 Beginning in 1863 and followed by the next twenty years, our image of Santa Claus was solidified by Thomas Nast’s cartoons for Harper’s Weekly, in which Santa is very clearly depicted with a big round belly, red and white clothes, a North Pole workshop filled with elves, and the lovely companion, Mrs. Claus. This Santa is also known to travel by sleigh, led by eight reindeer who can fly him around the world. But what about the ninth reindeer? One of the last additions to our idea of Santa came almost 100 years later, when Robert L. May published a story about Rudolph, the ninth reindeer who had a very shiny red nose. An advertising strategy for Montgomery Ward department store, this story resonated with millions of Americans, and it inspired the 1949 song written by Johnny Marks. The story of Rudolph was so popular that it was adapted into a 1964 movie, which is still viewed in homes across the country year after year. Speaking of reindeer, here’s a fun fact: male reindeer actually lose their antlers every year, while females keep theirs throughout the winter. Thus, it is likely that Santa’s reindeer are all female! The legacy of Saint Nicholas continues to live on. Ever wonder why tangerines are often given in Christmas stockings? It is believed that this is a remnant of Saint Nicholas’ tradition of dropping gold into stockings, as families who could not afford gold would substitute with these golden fruits! Furthermore, although the Dutch originally gave us the inspiration for Santa Claus, we later returned the favor, bringing the American Santa Claus to the Netherlands as the Kerstman (“Christmas man”). There are now two competing gift-givers in this part of the world! Sinterklaas continues to be celebrated with gifts on Saint Nicholas Day, while Santa Claus is celebrated on Christmas. 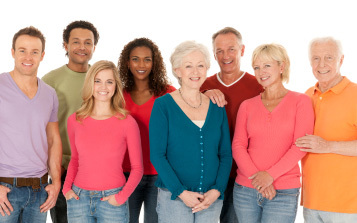 Some families choose one day to celebrate, but many follow both traditions. Imagine that! Next time you see an image of jolly ol’ Saint Nick, keep in mind the long history that came before him. Happy Saint Nicholas Day! Thanks; very interesting; Buon Natale!